I have some very important and exhilarating updates about Con-Geda, The 100 convention. I believe that you will enjoy them, and find them very useful! First and foremost, thank you to those who have contributed already to the Kickstarter. We have raised over $5700 of our initial goal of $15,000 USD, and that would not have been possible without the wonderful support of the backers. The first Con-Geda guest has been officially confirmed and is a beloved fan favorite. I can’t wait to share who it is in another post! The official dates will be June 22-24, 2018 for the convention, and we are quite happy that everything is coming along fluidly. We even gotten support and recognition from a fellow The 100 cast member! The launch of the official Kickstarter was on July 5th and will continue to run until August 4th, and I stated earlier, it already made a boom! If you are unsure on what a Kickstarter or what it’s purpose is, let me fill you in. Kickstarter is a campaign tool that it used to reach out to supporters, or backers to reach the monetary goals to accomplish a project. Backers who pledge will get access to the appreciation perks and Con-Geda insider stuff. The backers are NOT charged until the campaign is over. It is a much better option than extracting a bank loan to cover deposits for guests, and the venue. We don’t want to have the unnecessary burden of debt, and the fandom can be a huge part of the convention process. This is something that no convention or event company has done before. For Con-Geda to continue its planning, and to operate successfully, we are going to need YOUR help. By making a pledge, no matter the amount will aid the financial stage. As you know, when you make a pledge, you will get exclusive perks, including to write an article for Grounders Source. (Guidelines will apply). Other perks will include varying ticket packages that will access you into the Con, including photo-ops and autographs. Another is a handcrafted Clarke Griffin custom Pop! By @HarleyPin, and there will be autographs from the lovely cast members represented by I Don’t Do Subtle (IDDS) management, and adorable The 100 character pins from Parody Pins. The staff at End of the World Events, the company will be hosting Con-Geda has given lots of fun options to choose from. One of the several perk package will include this fan made Con-Geda necklace. Made by Fangirl Problems, Inc. Here is the link and video of the Kickstarter. 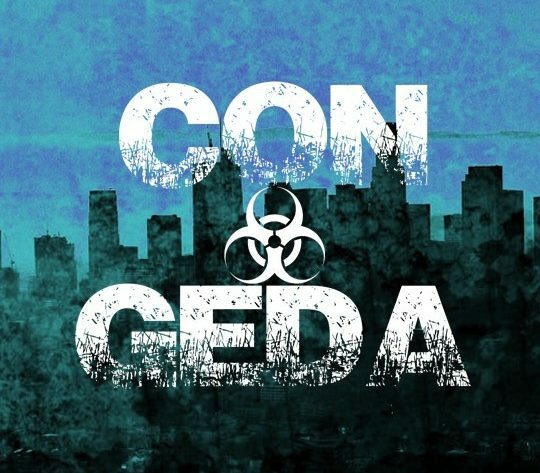 The Official Kickstarter for Con-Geda. The Kickstarter Widget will also be on the side menu of the site, so that you can keep track of the campaign when you visit. Remember, none of this would be possible without your help and support. We are beyond grateful for it! For more inclusive and detailed information about End of the World Events, please access the website here.